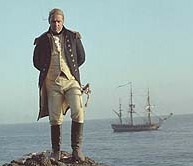 In the highest traditions of swashbuckling adventure, Australian Russell Crowe portrays Captain “Lucky” Jack Aubrey in the current blockbuster “Master and Commander: The Far Side of the World”. Acclaimed filmmaker and another Australian, Peter Weir, excels even himself with the authenticity and sheer high drama of this landmark period adventure. Weir, well known for his meticulous attention to detail, created filmmaking history by being the first and only director to ever take a feature film crew to the UNESCO World Heritage listed Galapagos Islands and uses the location to full effect in capturing the wonder of exploration and discovery in the early 19th century. Ship’s Surgeon, Dr Stephen Maturin, played by Paul Bettany, is completely engrossed by the unique biological treasures he discovers during their short stay on the Galapagos that predates Charles Darwin’s arrival by some thirty years. Adventure Associates have been sending passengers to The Galapagos since 1973 and these remote Ecuadorian islands remain one of the most popular destinations for all travellers to South America.